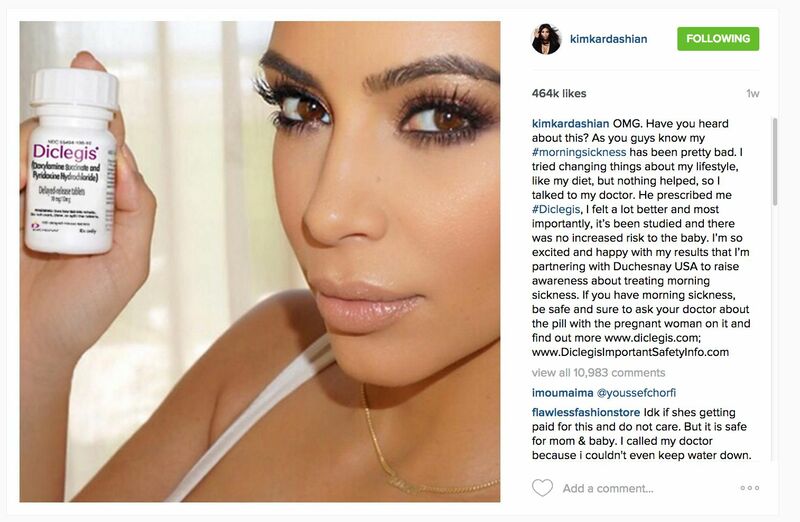 Kim Kardashian’s selfie endorsing Diclegis, posted to Instagram on July 19, 2015. It is not uncommon for celebrities to be paid to endorse products on their social media accounts, and, according to Politico, Kim and her mother, Kris Jenner, who shared the posts on both Twitter and Instagram, were in fact paid for this endorsement (which Kim was thanked for in a press release from Duchesnay). However, the issues arose only after FDA issued a warning letter to Duchesnay, the company that manufacturers Diclegis. We know how challenging it can be to stay on top of all of FDA’s rules and regulations regarding the advertisement of your products. That is why we are here to help! We have helped a number of companies comply with ad rules and ensure that they are only promoting their products in ways FDA will accept. To find out how we can help you comply with FDA’s rules and regulations or to learn more about our services, contact us today.